According to a news article from 20 November, JMA lowered the Alert Level for Hakoneyama to 1 (on a scale of 1-5) due to continuing low levels of seismicity. The Hakoneyama volcano includes large calderas, post-caldera domes, and active thermal areas about 80 km SW of Tokyo. Phreatic explosions have been radiocarbon dated to the 12th or 13th centuries CE, and periodic seismic swarms have been recorded since the late 20th century when regular monitoring began. Renewed activity at the Owakudani hot spring area (1 km N of the Kamiyama dome summit), including two small explosions and the formation of several new fumaroles, was reported by the Japan Meteorological Agency (JMA) in 2015. The area is a popular resort destination with golf courses, spas, skiing, and aerial tramways. Seismic swarms were previously reported in 1991 (BGVN 16:04), 2001, 2011, and 2013. A slight inflation of the volcanic edifice was recorded between December 2012 and March 2013. Increased seismicity and intense steam emissions at Owakudani were observed beginning in April 2015, and on 29 and 30 June 2015 two small explosions from a new fumarole created a mound of ash around the vent and scattered ash a few hundred meters N. Additional ash was observed in the early morning of 1 July. Strong degassing from the fumaroles continued through the end of the year, although seismicity dropped below detection by mid-August, and inflation stopped at the end of August. Activity during 1991-2014. A swarm of about 300 earthquakes, all less than M 2.5 and located at 5 km depth below the central part of the caldera, was reported by JMA in April 1991 and felt by area residents (BGVN 16:04). Between June and August 2001 elevated seismicity from depths less than 5 km below the surface was associated with a small amount of inflation centered at the volcano; a small swarm was also recorded under the N end of Ashino-ko (Lake Ashi). A brief period of increased seismicity was again recorded in the few days following the 11 March 2011 Tohoku Earthquake which was centered about 400 km NE. The activity was confined to the area around the Owakudani hot springs. On 21 March 2011, a M 4.2 earthquake occurred around the Komagatake dome (1 km SSE of Kamiyama). 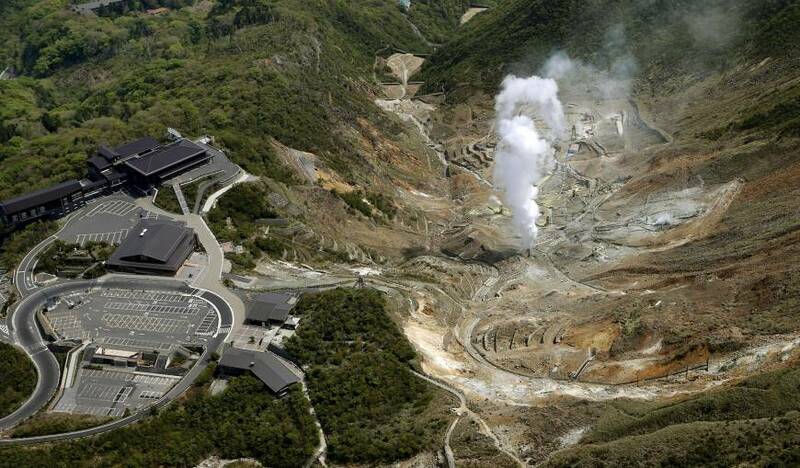 Fumes from the Sounjigoku geothermal area on the E side of the volcano were observed rising 50-200 m during March 2011. The tiltmeter network operated by the Hot Springs Research Institute of Kanagawa Prefecture showed no relevant changes resulting from the earthquake. Between January and March 2013, JMA reported a slight increase in the number of shallow earthquakes in the area between Komagatake and Sengokuhara Hot Spring (4 km NE of Kamiyama dome). Strainmeter and tiltmeter observations recorded a slight inflation of the volcano that began at the end of 2012 and stopped by the end of February 2013. Activity during 2015. Scientists conducted field surveys on 4-5 April 2015 and observed forceful steam emissions at the Owakudani hot spring complex that continued at least through 8 April. Six small seismic events were recorded on 10 April in the Yumoto area of the city of Hakone (8 km ESE). JMA reported an increased seismicity to tens of daily events at Hakoneyama beginning 26 April 2015. On 5 May, three more small seismic events were recorded in the Yumoto area. This led JMA to raise the Volcano Alert Level from 1 (Normal) to 2 (Do not approach the crater) on a 5-level scale on 6 May. There were 21 additional small seismic events in the Yumoto area during May 2015. The daily total of all seismic events rose significantly to 442 on 15 May, the highest since 2001. Ground deformation data showed changes attributable to the seismic events. The Mainichi (a daily newspaper) reported on 17 May 2015 that an analysis of satellite data by the Geospatial Information Authority of Japan found that the ground level in a 200-m-diameter area in the Owakudani district rose 12 cm between 17 April and 15 May. Intense steam emissions continued at the Owakudani hot spring supply complex in May (figure 1). Figure 1. An aerial photo taken by the Kyodo News helicopter shows steam rising from the Owakudani hot spring supply facility at Hakoneyama on 7 May 2015. Courtesy of The Japan Times. Volcanic tremor lasting for around five minutes started at 0732 on 29 June 2015. At around 1245, fallout was observed in an area up to 1.2 km N and NE of the Owakudani hot spring complex. This fallout was interpreted by JMA to be sediment and debris ejected from a "blowhole" that formed a new fumarole at Owakudani. A field survey conducted on 30 June observed a mound of volcanic ash around the new fumarole. Additionally, volcanic ash was observed near the Owakudani Station of the Hakone Ropeway (a resort tramway) located about 300 m NNW of the hot springs area. As a result of the discovery of the ashfall, JMA raised the Alert Level at 1230 on 30 June from 2 to 3 (Do not approach the volcano). Additional volcanic ash was found on a camera around 0500 on 1 July. Air shocks that were intermittently observed from 1600 on 29 June to 1 July may have occurred in association with eruptions, the last occurring between 0400 and 0500 on 1 July. A field survey conducted by the Hot Springs Research Institute of Kangawa Prefecture and JMA on 2 July confirmed continued forceful emissions of steam at the new fumarole, which had grown to 20 m in diameter, and was designated Crater 15-1. Three other new fumaroles were also observed around this crater. No low-frequency earthquakes or volcanic tremors were recorded in July, but active degassing at Crater 15-1 and adjacent fumaroles continued. In a field survey on 6 August 2015, material described as "dark gray soil" was observed around the fumarole, inside the crater rim. Thermal infrared observation showed a high-temperature area on the E side of the crater from August through October. A single, minor seismic event was recorded on 17 August, the first one since 3 July. JMA downgraded the Alert Level at the volcano from 3 (Do not approach the volcano) to 2 (Do not approach the crater) on 11 September, and no further changes in the tiltmeter or strainmeter data were observed after August. Field surveys on 3 and 29 September indicated that "dark gray soil" continued to be ejected from Crater 15-1, but the scale of the explosions were small and ejection heights were lower than the crater rim. Strong degassing was still occurring at the crater and all other fumaroles. By 20 November the slight weakening of the emissions from Crater 15-1 and overall stability and low seismic activity led JMA to reduce the Volcanic Alert Level further to 1 (Potential for increased activity). Field observations on 7 and 9 December 2015 confirmed continuing strong degassing with plumes to 600 m in the area around Owakudani, but no new ejecta. Information Contacts: Japan Meteorological Agency (JMA), Otemachi, 1-3-4, Chiyoda-ku Tokyo 100-8122, Japan (URL: http://www.jma.go.jp/); The Mainichi, Japan's National Daily since 1922 (URL: http://mainichi.jp/english/); The Japan Times (URL: http://www.japantimes.co.jp/news/2015/05/07/national/volcano-alert-raised-mount-hakone/#.WHkqQHrcDy1). On 12 July JMA reported that the webcam continued to record vigorous fumarolic plumes rising from Hakoneyama's Owakudani hot spring area. The Alert Level remained at 3 (on a 5-level scale). According to a news article a drone that surveyed the Owakudani hot spring district at Hakoneyama recorded damage to three hot spring supply facilities; an exclusion zone for visitors was in effect due to increased seismic activity and an Alert Level raise to 2 (on a 5-level scale) on 6 May. At 1230 on 30 June a small-scale eruption occurred and the Alert Level was raised to 3. On 1 July a news article noted another small-scale eruption (occurring between 0400 and 0500), and JMA reported that ash deposits were visible with the webcam. During fieldwork on 2 July, scientists confirmed new fumaroles at Owakudani that were vigorously emitting white plumes; the new fumaroles had formed during 29-30 June. White fumarolic plumes continued to be emitted through 5 July. JMA reported that on 29 June scientists visiting Hakoneyama observed new fumaroles in a landslide-prone area, appearing after a possible landslide had occurred. Fresh sediment deposits within 2 km were possibly caused by the formation of the fumaroles. Seismicity began increasing at 1930, and a 5-minute-period of volcanic tremor began at 1932. At 1230 on 30 June a small-scale eruption occurred. The Alert Level was raised to 3 (on a 5-level scale). JMA reported that during 14-17 May seismicity at Hakoneyama remained high. Inclinometer data showed variations related to seismicity, and vigorous steaming from the hot springs was observed. The Alert Level remained at 2 (on a 5-level scale). According to a news article, the ground level in the Owakudani hot spring area had risen 12 cm during 17 April-15 May; the deformation occurred in an area 200 m in diameter. The article also noted that 471 earthquakes were recorded on 15 May, the highest number ever recorded there in one day. On 6 May JMA raised the Alert Level for Hakoneyama from 1 to 2 (on a 5-level scale). Seismicity had increased on 26 April, and on 5 May three events occurred that were Intensity I. Inclinometer data showed variations related to seismicity, and vigorous steaming from the hot springs was observed. Seismicity remained elevated at least through 10 May. Elevated seismicity had been recorded at Hakone during June 2001 to at least 8 August. The seismicity was associated with a small amount of inflation that was centered at the volcano. Earthquake hypocenters occurred at depths less than 5 km beneath the volcano. A small swarm was also recorded under the northern end of the Ashino-ko (caldera lake). JMA noted that the change in activity might not be a precursor to an eruption since similar activity has occurred in the past that was not followed by an eruption. A swarm of ~300 earthquakes (M <= 2.5) was recorded between 1000 and 1300 on 22 April. Several of the earthquakes, located at 5 km depth in the central part of the caldera, were felt by area residents. Seismicity gradually declined, and had returned to normal by 24 April. No changes in surface activity were observed. Earthquake swarms have been recorded about once a year, including one in August 1990 (M <= 5.1), at the volcano's E foot. Hakone erupted phreatically about 3,000 years ago, and many fumaroles and hot springs remain active. 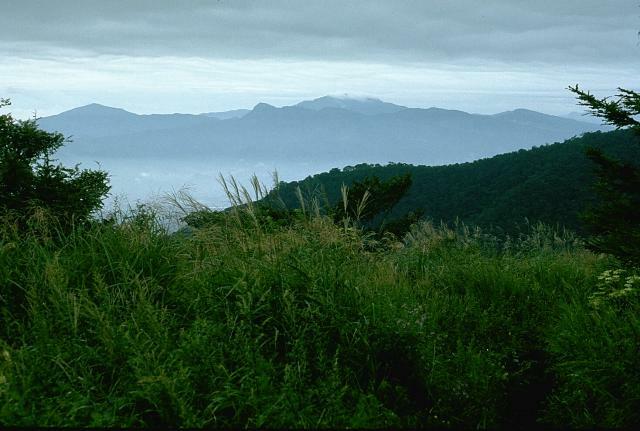 Hakoneyama volcano is truncated by two overlapping calderas, the largest of which is 10 x 11 km wide. The calderas were formed as a result of two major explosive eruptions about 180,000 and 49,000-60,000 years ago. Scenic Lake Ashi lies between the SW caldera wall and a half dozen post-caldera lava domes that were constructed along a NW-SE trend cutting through the center of the calderas. Dome growth occurred progressively to the NW, and the largest and youngest of these, Kamiyama, forms the high point. The calderas are breached to the east by the Hayakawa canyon. A phreatic explosion about 3000 years ago was followed by collapse of the NW side of Kamiyama, damming the Hayakawa valley and creating Lake Ashi. The latest magmatic eruptive activity about 2900 years ago produced a pyroclastic flow and a lava dome in the explosion crater, although phreatic eruptions took place as recently as the 12-13th centuries CE. Seismic swarms have occurred during the 20th century. Lake Ashi, along with the thermal areas in the caldera, is a popular resort destination SW of Tokyo. Hakamata K, Sugiyama S, Imanaga I, Mannen K, Oki Y, 2005. K-Ar ages of Hakone volcano, Japan. Bull Volc Soc Japan (Kazan), 50: 285-299 (in Japanese with English abs). Kobayashi M, Mannen K, Okuno M, Nakamura , Hakamata K, 2006. The Owakidani tephra group: a newly discovered post-magmatic eruption product of Hakano volcano, Japan. Bull Volc Soc Japan (Kazan), 51: 245-256 (in Japanese with English abs). Kobayashi M, Okuno M, Nakamura T, 1997. 14C ages of pyroclastic-flow deposits from central cones on the western slope of Old Somma of Hakone volcano, central Japan. Bull Volc Soc Japan (Kazan), 42: 355-358 (in Japanese). Kuno H, Oki Y, Ogino K, Hirota S, 1970. Structure of the Hakone caldera as revealed by drilling. Bull Volcanol, 34: 713-725. Oki Y, Aramaki S, Nakamura K, Hakamata K, 1978. Volcanoes of Hakone, Izu and Oshima. Hakone: Hakone Town Office, 59 p.
There is no Deformation History data available for Hakoneyama. There is no Emissions History data available for Hakoneyama. Hakone volcano, seen here from the west, is a broad stratovolcano truncated by two large calderas. A group of dacitic lava domes was constructed in the center of the caldera. The highest dome, Kami-yama, forms the high point of the volcano, topped by the clouds in the center of the photo. The caldera was created during two large Pleistocene eruptions. The latest eruption at Hakone took place about 3000 years ago, although seismic swarms have occurred frequently during the 20th century. 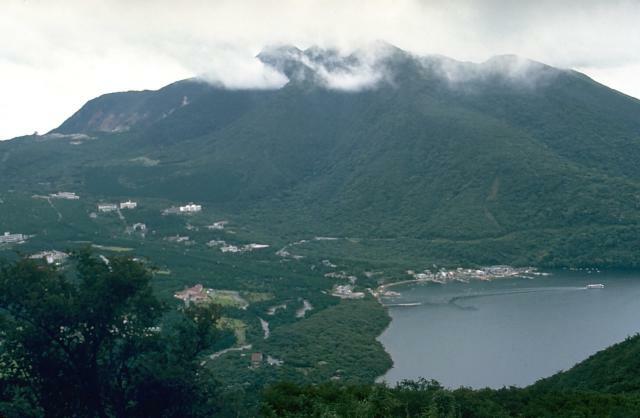 The slopes of a group of post-caldera dacitic lava domes rise at the left above Lake Ashi, which is constrained against the SW rim of Hakone caldera. 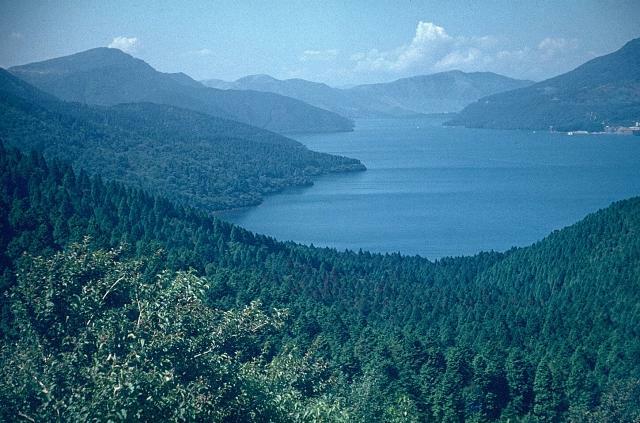 Lake Ashi was formed when an avalanche from Kami-yama, the highest of the central lava domes, blocked river valleys that drain to the east through a breach in the caldera wall. 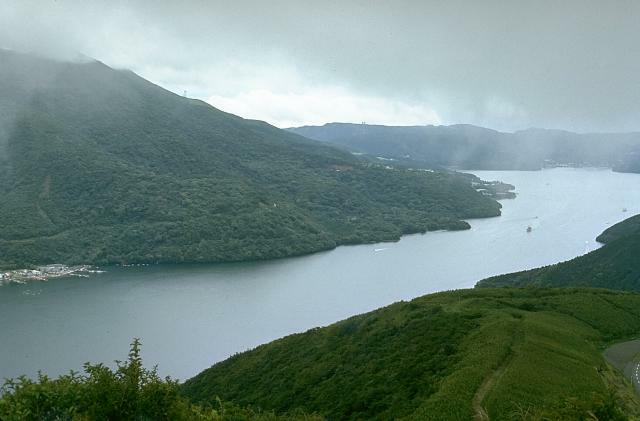 Scenic Lake Ashi, seen here from the SE, occupies the SW corner of Hakone caldera. Hakone contains two calderas, the largest of which is 10 x 11 km wide. The arcuate caldera rim is at the left, and the slopes of a group of post-caldera cones form the right-hand shoreline. Post-caldera eruptions have constructed a half dozen lava domes along a SW-NE trend cutting through the center of the calderas. The latest eruption took place about 3000 years ago, although seismic swarms have occurred frequently during the 20th century. Photo by Lee Siebert, 1963 (Smithsonian Institution). 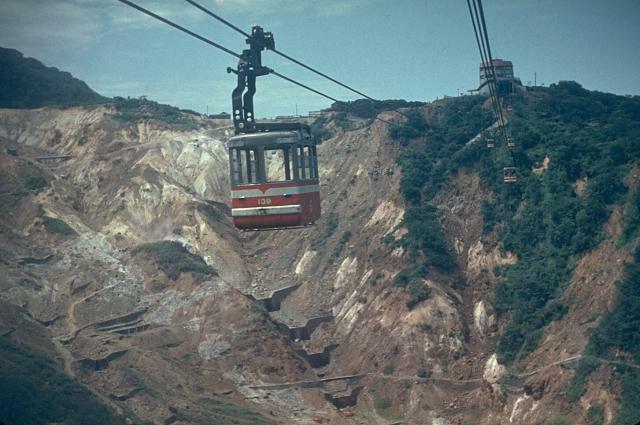 Aerial cable cars stretching across Owakudani provide a view of one of the many thermal areas in Hakone caldera. Hot spring resorts surround a complex of lava domes in the center of Hakone caldera, which is a popular vacation destination SW of Tokyo. Kamiyama, the highest of a group of lava domes forming the central cone complex of Hakoneyama caldera, rises east of Ashinoko (Lake Ashi). The lake was formed about 3100 years ago when collapse of the NW side of Kamiyama dammed the Hayakawa river valley at the north end of the lake (lower left). Dome and spine extrusion at Kamiyama about 200 radiocarbon-years later marks the last known eruptive activity of Hakone volcano. The following 60 samples associated with this volcano can be found in the Smithsonian's NMNH Department of Mineral Sciences collections, and may be availble for research (contact the Rock and Ore Collections Manager). Catalog number links will open a window with more information. Large Eruptions of Hakoneyama Information about large Quaternary eruptions (VEI >= 4) is cataloged in the Large Magnitude Explosive Volcanic Eruptions (LaMEVE) database of the Volcano Global Risk Identification and Analysis Project (VOGRIPA).